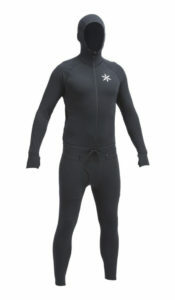 Airblaster Ninja Suits Are The Best Base Layers For Kids & Adults. Period. Airblaster Ninja Suits are one-piece, hooded, long underwear, and they’re one of the best things to happen to the outdoor adventure world since the invention of GORE-TEX. Think I’m stretching the truth? Read on and make up your own mind. Either way, Ninja Suits are pretty freaking sweet and you need to add them to your outdoor gear arsenal for you and your kids. This base layer has a hood (women’s has a ponytail portal), a full-length front chest zipper, comfy thumbhole loops, a 350 degree waist zipper for taking care of duties when nature calls on line two, and guys have a front fly for breathability and when nature’s call is on line one. Now that should be enough to sell you (in which, case go straight to Airblaster.com), but if not, let’s break down these stealthy masters of warmth. 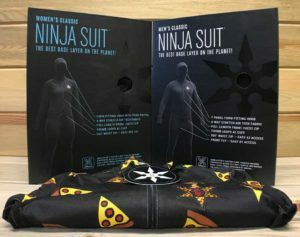 My wife, daughter and I all got Airblaster Classic Ninja Suits (as opposed to the Merino Wool ones) and put them to the test over a few weeks. They arrived just before we (finally) got a string of snowstorms in Colorado. We skied in them, snowboarded in them, hiked in them, took a weekend road trip in them, shoveled snow in them, walked the dog in them, shoveled more snow in them, and chillaxed with hot cocoa in them—and I gotta say, these things were awesome. Warm, breathable, they didn’t stink up, and they held up to a fair amount of abuse. But wait, there’s more! First of all, the Airblaster Ninja Suit is fun as evidenced by the feature photo of my daughter wearing hers for the first time during an overnight camping trip. My daughter got the pepperoni pizza print, which is just awesome. 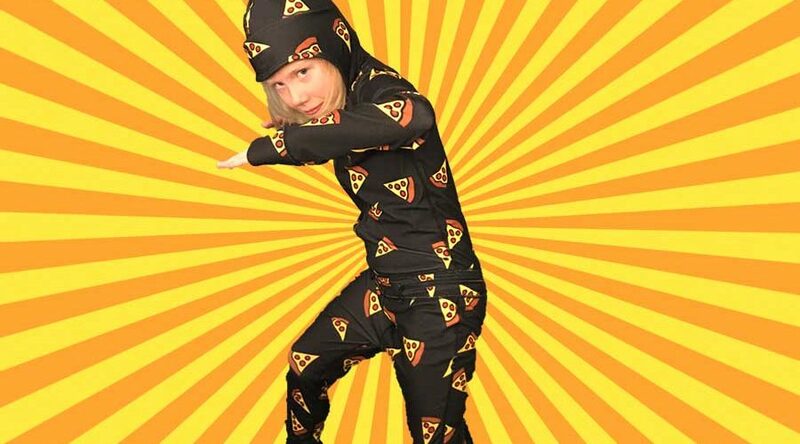 A pizza ninja? So cool. They’ve also got fish prints, outer space prints, camouflage, stripes, a new collaboration color with Gnu snowboards, and tons more. These days you expect your base layers to be breathable and sweat wicking. But, this fabric is nice, so it’s worth mentioning the guys at Airblaster spent a lot of time developing this fabric. It’s really soft and features 4-way stretch so it fits really nicely, wrapping around your arms and legs like an extension of your skin. Airblaster doesn’t give a temperature rating for their fabric, but it’s a midweight thickness, and I found it to be comfortable across a wide range of temps. Not too hot and not too cold. To give you an idea, my Ninja Suit kept me warm snowboarding early in the morning when it was -2 with the wind chill, yet I didn’t overheat when the temps rose to the 40s by lunch. One of the most unique features of the Airblaster Ninja Suit is the 350-degree waist zipper. When I told my daughter that the waist zipper was there so you can go to the bathroom, she laughed. But when she realized I wasn’t kidding, her face got serious, she immediately tested it out, and the benefit became clear to her. There’s nothing more annoying when you’re camping, or whatever, in the cold and you have to pee or poop. The 350-degree waist zipper minimizes the amount of skin that gets exposed to the cold and lets you do your business in greater comfort. Genius! The other defining feature of the Ninja Suit is the hood. I’ve never had a hood built into my base layers, and now I’m wondering how I got on without it. 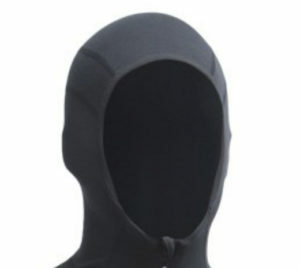 Made with 7 panels, this hood forms around your head nice and snug without any weird puckering shapes sticking out. It fits just like you’d expect a ninja suit to fit. The obvious benefit is that the hood keeps your head cozy and warm, which is important, because as we all know, you lose 40-80% of your body heat through your head (totally false, btw…your mom lied to you about this. Read why >). This is good on camping trips to keep extra warm while your head sticks out of the sleeping bag. You can also easily fit your ski or snowboard helmet over the hood for an extra layer of insulation. I say that sizing is an important topic because I’m one of those people who sits right in the middle of two sizes, medium and large. If you’re one of those people, I’d recommend you choose the larger size of Ninja Suit. I’m 5’11”, 170 pounds, have a 32 waist, and 40/41 chest, which couldn’t be any more in the middle of Airblaster’s medium and large. I chose the large size and it actually fits me perfectly. Check out their size chart here. Read their guidance carefully—there’s good fitting instructions in there. THE GUARANTEE. IT’S A GOOD ONE. They say Ninja Suits are the product of 10 years of testing and abuse by a roaming team of wild ambassadors. As a result, these things are supposed to hold up to everything you can throw at them. My family’s only put ours to the test for a few weeks, so I can’t say for sure they’re bombproof, but so far so good. BUT, Airblaster says they back their product for up to a year, which is pretty good for a pair of long skivs you can wear for every cold-weather outdoor activity you can think of. HOW MUCH WILL THEY RUN YOU? Let’s start by comparing the price of other high quality base layers. A set of Patagonia top and bottom long underwear will run you $150 just for the basic base layers. Smartwool will run you $155. Even REI’s basic top and bottom combo are about $100. Airblaster Ninja Suits are about $110 for adults and $70 for kids. Considering you get a boatload more features than just about any other base layer on the market, I’d say it’s well worth it. And that’s all folks. I don’t usually gush about outdoor gear. I keep my gear pretty simple and keep it for a long time. I only just replaced my snowboard boots because the outsole started separating from the boot after 12 years of use. So, to go on and on about a product like Airblaster Ninja Suits means it’s pretty cool in my book. Get your own and you’ll see.